MongoDB takes security very seriously. Recently a blog post discussed the fact that there are unsecured instances of MongoDB running openly on the internet. As the post caused some discussion online, we wanted to take the chance to reaffirm our security best practices. Security is addressed in detail in our Security Manual. The Security Checklist discusses limiting network exposure. Note that the method to do this will vary depending on where the service is hosted (AWS, Azure, locally, etc). Additionally, users of MongoDB Cloud Manager as well as MongoDB Ops Manager can enable alerts to detect if their deployment is internet exposed (see figure below). A recording of a webinar on Securing your MongoDB Deployment is available along with slides. We encourage users who have experienced a security incident with MongoDB to create a vulnerability report. 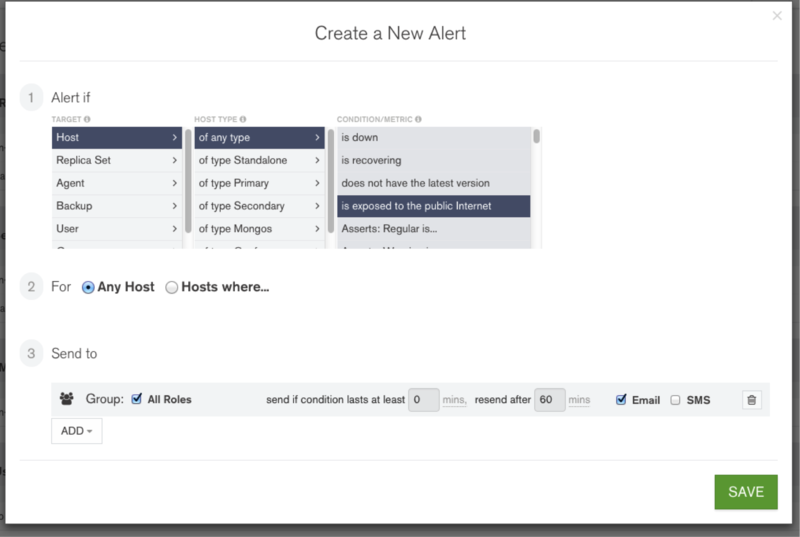 How to create a new alert to notify of host being exposed to the public internet. Kelly Stirman is the VP of Strategy at MongoDB. Kelly works closely with customers, partners and the open-source community to articulate how MongoDB is quickly becoming the world's most popular database. For over 15 years he has worked at the forefront of database technologies. Prior to MongoDB, Kelly served in executive and leadership roles at Hadapt, MarkLogic, PeopleSoft, GE, and PricewaterhouseCoopers.